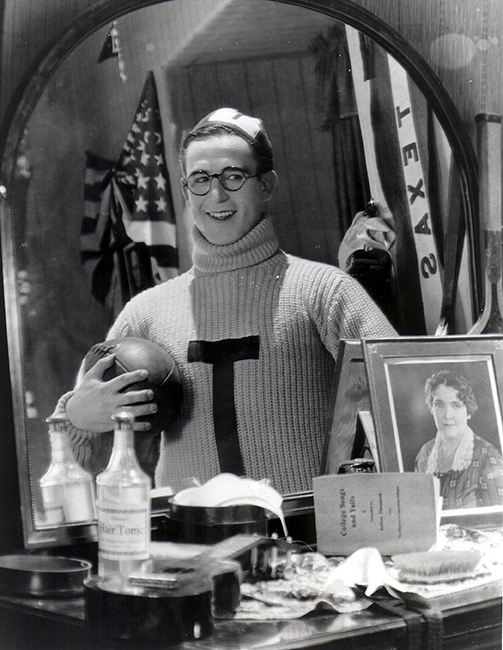 The San Francisco Silent Film Festival kicks off another exciting season with a June 1 screening of Harold Lloyd’s 1925 campus comedy The Freshman at the Castro Theater, accompanied by the Berklee Silent Film Orchestra. The Freshman was Lloyd’s greatest hit, the third biggest release of 1925, and the second most successful comedy of the entire silent film era. College enrollment soared after World War I, nearly doubling during the 1920s, while a new style of red‐blooded sports journalism, and the advent of radio, and live-game broadcasts, turned college football into a national obsession. With his winning personality, leading man looks, and team of clever gag writers, Lloyd was the perfect comedy star to bring the college craze to the big screen. Looking east (l) and north (r) at the cannon beside the former Ontario City Hall. Los Angeles County is so large and varied that Lloyd rarely traveled anywhere else to shoot. 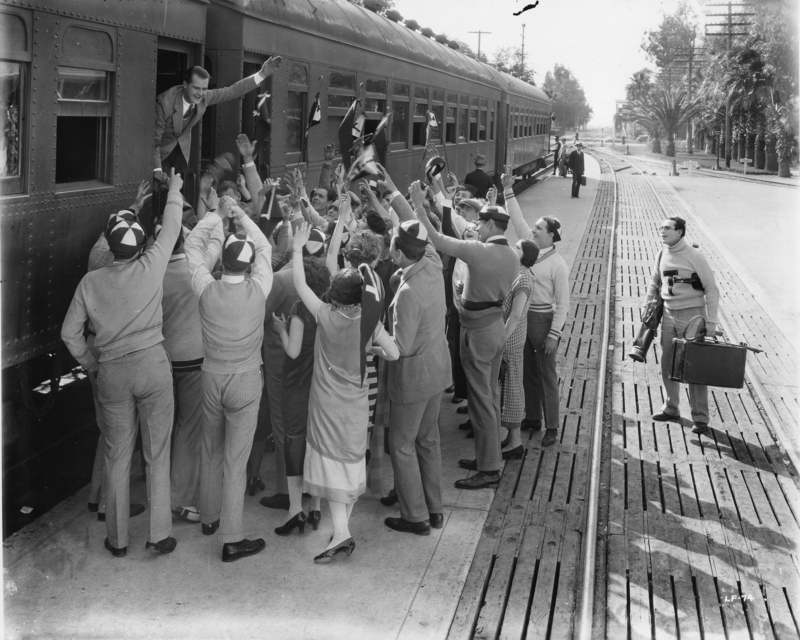 So it was unusual that Lloyd would travel to remote Ontario, then a small farming town in San Bernardino County, to film his character arriving at school beside the Southern Pacific depot. The former Ontario City Hall, and its Civil War-era cannon once standing on the corner of Euclid and Emporia due west of the train station, appear early in the film. The former State Exposition Building (Bowen Hall) at Exposition Park, with the sunken rose garden at back. Harold has unwittingly agreed to buy the gang ice cream (l), while Buster strolls near by in College. LAPL. The USC campus was still rather small in 1925, and the UCLA campus in Westwood would not be established for another five years. So Lloyd filmed the campus scenes at Exposition Park instead, even though USC was just across the street. 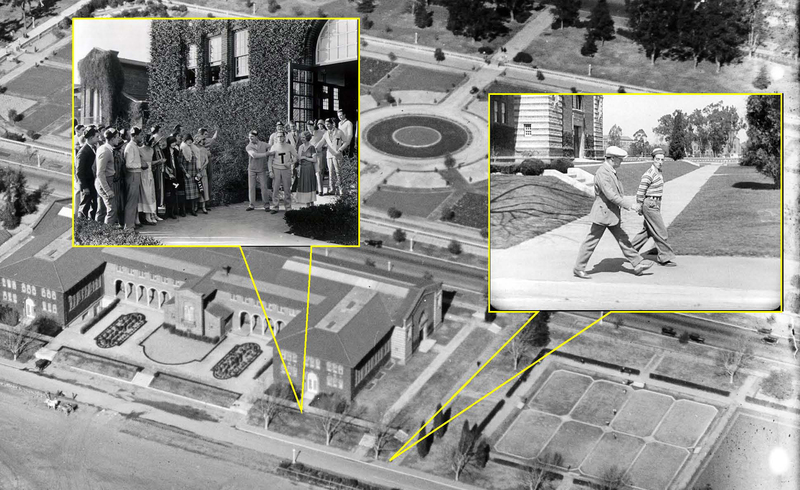 Buster Keaton would film scenes from his later 1927 campus comedy College at the same corner. You can read more about Harold and Buster filming at Exposition Park at this earlier post. The ‘new’ 1923 USC locker rooms at Bovard Field, in The Freshman (l) and in College (r). The USC bleachers at Bovard Field. 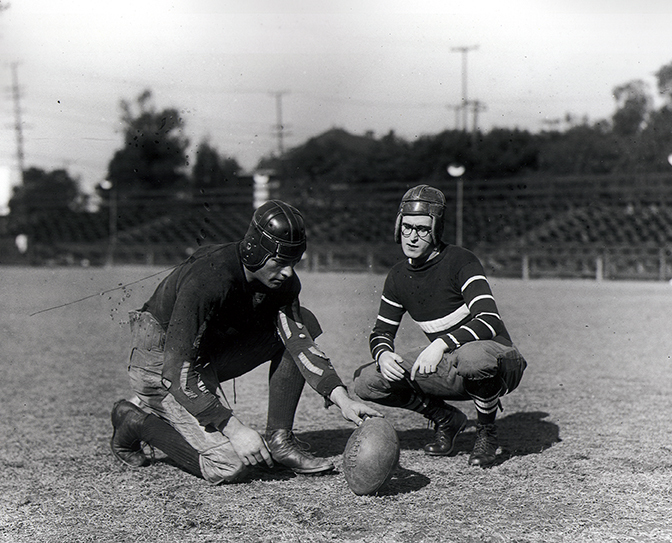 The USC football team originally played home games at modest Bovard Field, behind the USC Old College Building, equipped with wooden bleachers that seated only a few thousand people. Out‐manned during the early years, the press dubbed the USC team the “Trojans” for fighting on despite overwhelming odds against better‐equipped opponents. 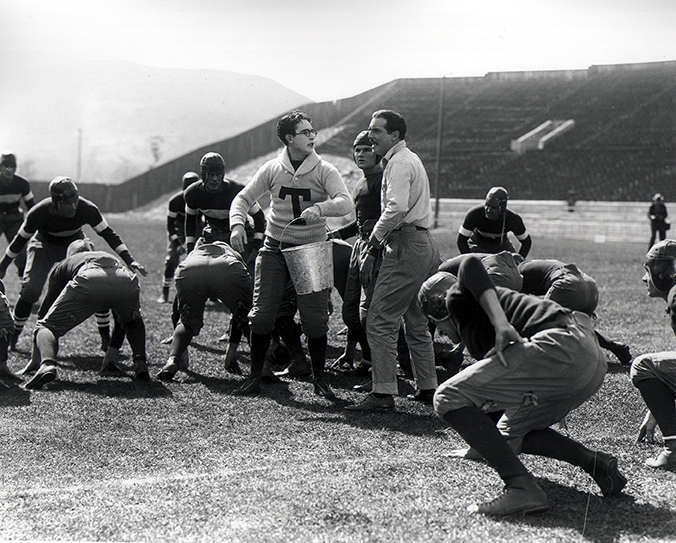 Lloyd filmed all of the football practice scenes at this field, used also for Keaton’s baseball scenes in College, and for the football scenes in Keaton’s Three Ages (1923). 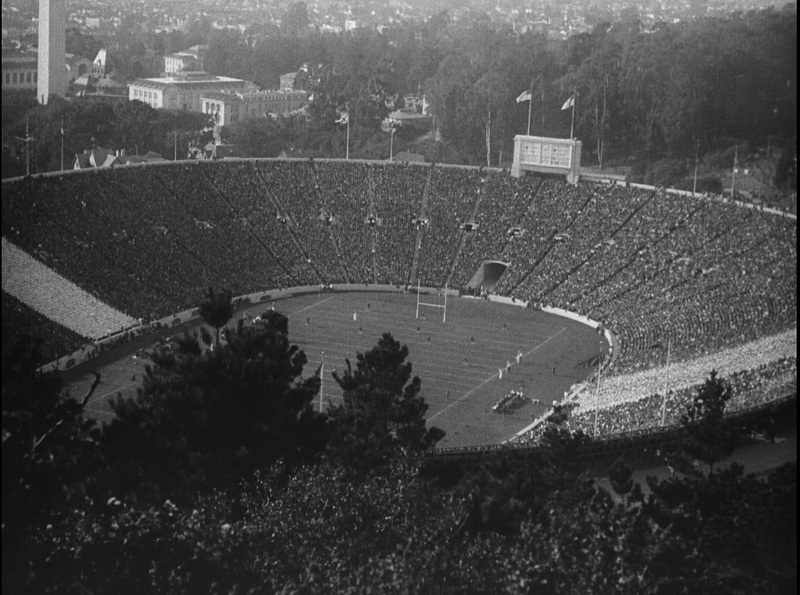 Filming at the Rose Bowl – horseshoe-shaped until the south end was closed over in 1928. 1923. 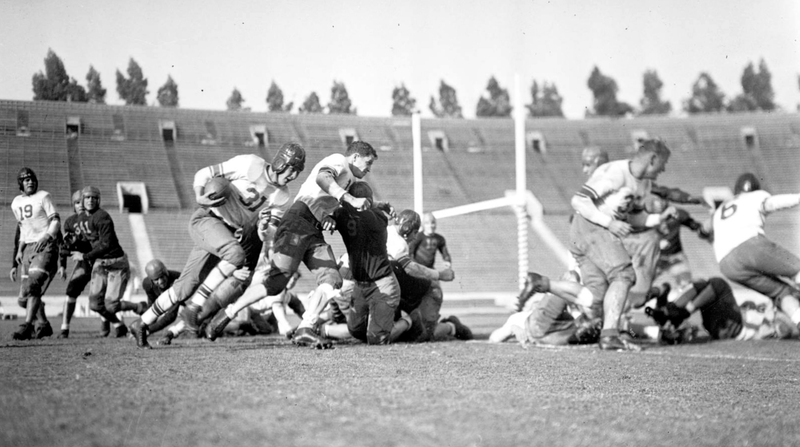 Lloyd created The Freshman by blending footage shot at three of the four stadiums; most playing field sequences were staged at the Rose Bowl, medium views of Harold on the bench, with extras filling in the bleachers behind him, at the Coliseum, and wide full stadium views up at Berkeley. White shirt in the movie (l) – dark shirt in the production stills (r). 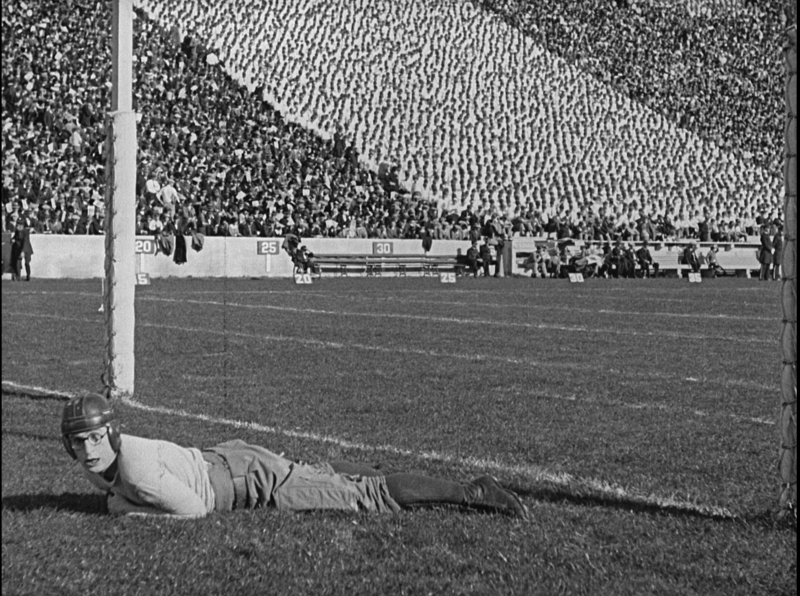 Lloyd began filming The Freshman by jumping straight to the climatic football game sequence, staged at the empty Rose Bowl. But Lloyd soon realized it was a mistake ‐ without understanding his character’s motivation, the sequence just didn’t work. So Lloyd scrapped the early scenes, and filmed the movie in sequential order instead. Lloyd wore a white shirt when he filmed the game sequence for the second time, so his character would stand out from the other players wearing black. In a nod to efficiency, Lloyd kept the production stills taken when he was also wearing black. Thus, there are moments were Lloyd wears a white shirt in the movie, and a black shirt in the matching photographs. undefeated season for both teams. 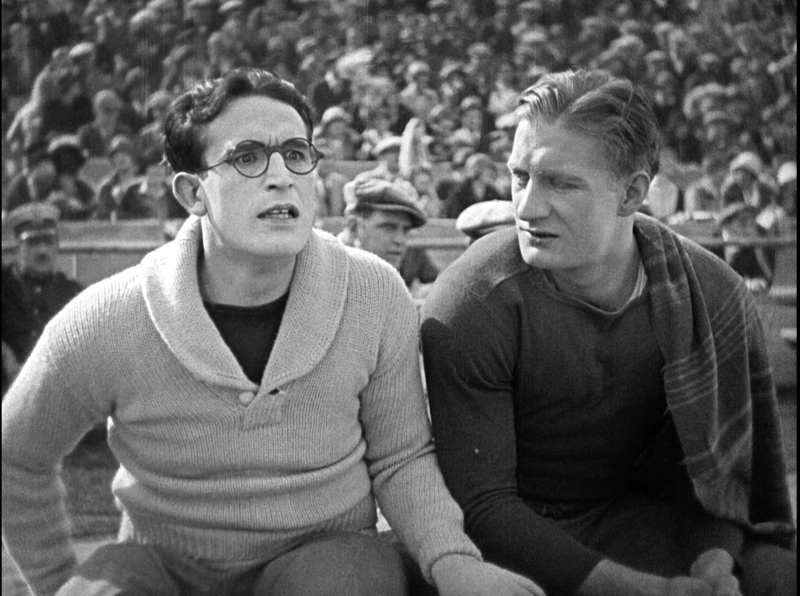 Unlike Chaplin and Keaton, who filmed early on several times in San Francisco and near Truckee, filming The Freshman at Berkeley is apparently the first time Harold Lloyd ever left Southern California to shoot. Lloyd quickly shot key scenes on the field during half-time, later joking that he employed 90,000 extras to appear in his film. 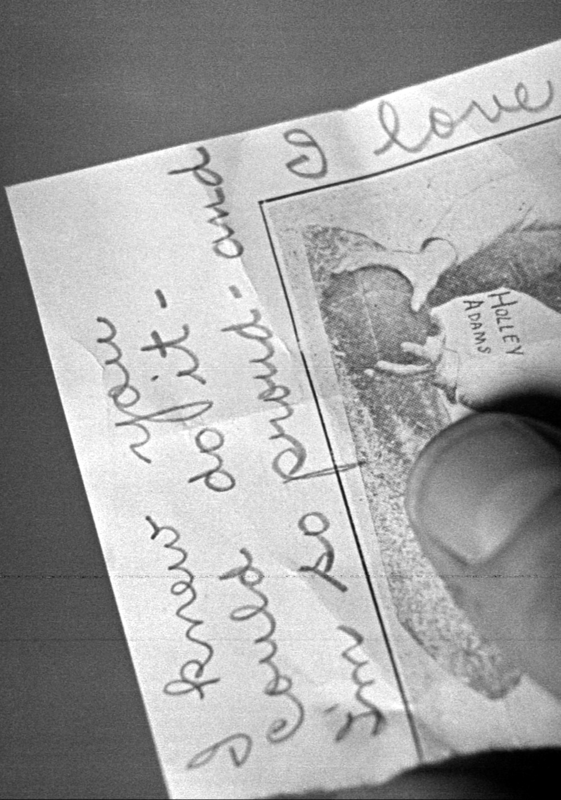 Jobyna’s love note to Harold was scribbled on an authentic football program. Holley Adams, pictured here (click to enlarge), played center for USC. The Freshman is available on Blu-ray from The Criterion Collection. This post is condensed from my visual essay on the disc. 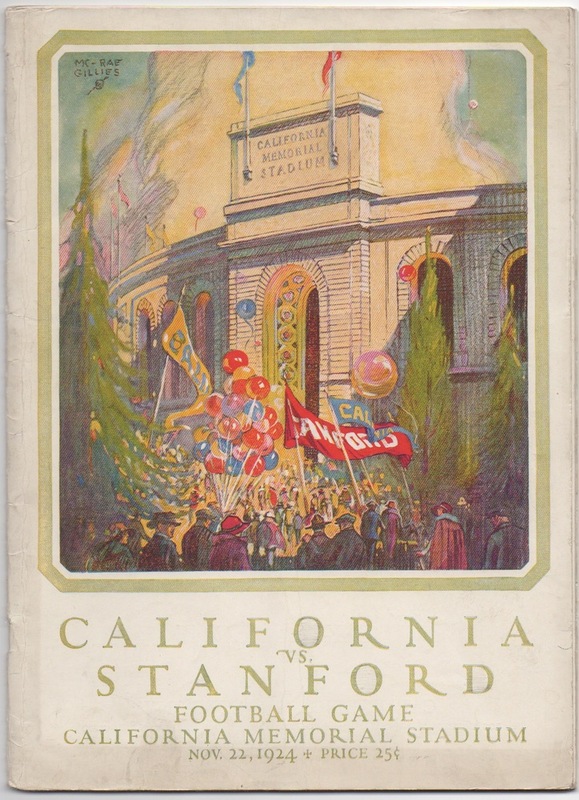 This entry was posted in Harold Lloyd and tagged California Memorial Stadium, Harold Lloyd, Los Angeles Colesium, Silent Comedians, Silent Comedies, Silent Movie Locations, Silent Movies, The Big Game, The Freshman, The Rose Bowl, then and now, USC. Bookmark the permalink.